Add a sophisticated look to your bath. Our cultured surfaces provide durability and a heightened resistance to thermal cracking. Coverage for all cultured granite vanity tops lasts from 3 years from the original date of purchase. For more information please call 1-855-995-5578. Bring the long-lasting beauty of granite to your bathroom with the Pegasus Granite Vanity Top in Beige. Beveled edges are carved around the front and the bowl cutout to create an elegant appearance, while the included vitreous china bowl completes your look. Installation is easy thanks to the top's pre-drilled faucet accommodations and included 4-inch high backsplash designed to protect your wall from water damage. This natural granite vanity top is factory polished to create a smooth, glossy surface that resists cracking, discolouring and chipping, so you can count on durability and top-quality appearance for years to come. Transform your bathroom with a stunning Granite Vanity Top from Pegasus. Perfect for quick and hassle-free remodels, this top lets you achieve the beauty and durability of genuine granite without hiring a professional. 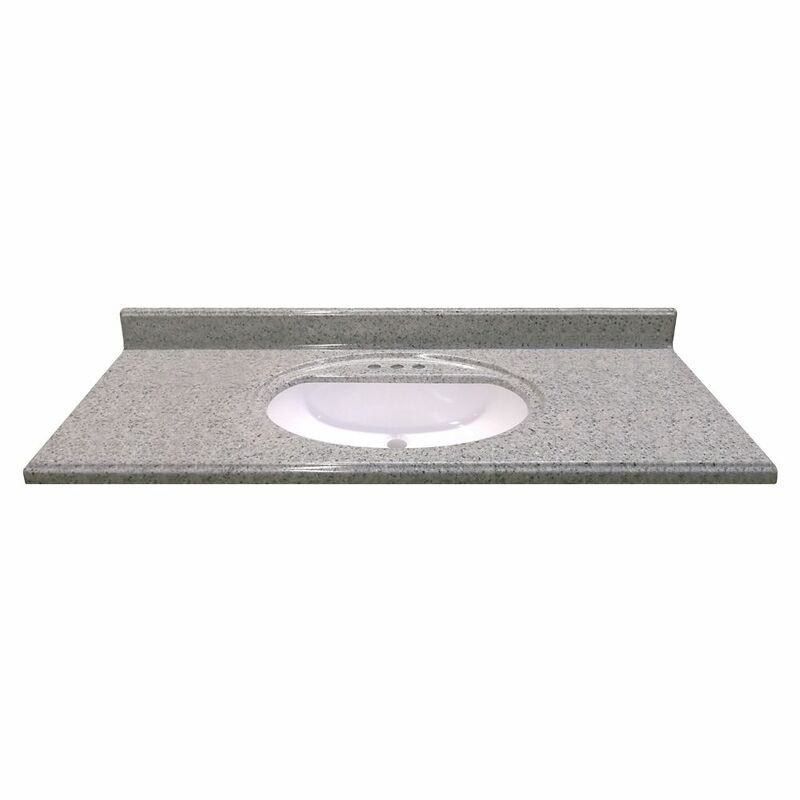 Complete with a pre-attached undermount vitreous china trough bowl, the granite top is easy to install and fits directly on top of any standard 48-inch vanity cabinet. Please note that granite is a natural material, so slight colour variation may occur as part of its distinctive appeal. Add a sophisticated look to your bath with Magick Woods vanity tops. Our cultured surfaces provide durability and a heightened resistance to thermal cracking. 49-Inch W x 22-Inch D Cultured Granite Vanity Top in Luna Moonscape with Recessed Bowl Add a sophisticated look to your bath. Our cultured surfaces provide durability and a heightened resistance to thermal cracking. 49-Inch W x 22-Inch D Cultured Granite Vanity Top in Luna Moonscape with Recessed Bowl is rated 4.3 out of 5 by 4. Rated 5 out of 5 by Rick from Quality / Price Unbeatable Replaced my previous vanity couter top with this new one. It was so easily done using online video on how to do it. It looks great at very little cost. Rated 5 out of 5 by Heather from Good vanity top and sink for a great price I bought this a month ago and it is not real granite, but it looks great in my bathroom. It's easy to keep clean too because it doesn't have crevices around the sink to collect water and dirt. is it 49 inches or 50 inches as in the specs? Thanks, going to order it. So is this vanity top 49 by 22 or 50 by 23 as stated in the specifications? Yes, it fit our space perfectly.